Lakeland Dairies will open applications for our 2020 Graduate Programme next year in October 2019. ​The Lakeland Dairies Graduate Programme is specifically structured to provide you with the opportunity to enhance and develop your skills over a two year period. During this time, you will complete placements in appropriate functions and departments within the company, relevant to your discipline. You will work on a number of exciting projects in conjunction with fellow graduates and employees of Lakeland Dairies. In parallel with this, you will complete External Management Training. 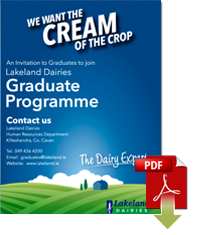 Lakeland Dairies will open for Graduate applications on the 1st October until the 31st December for their Graduate Programme. Please click on the “Documents” button beside the graduate application form to review more information on the roles for this graduate intake. To apply online please go to our Careers Opportunities page. The Graduate application is listed as a vacancy so click on the Apply button at the right of the screen. Following the application process, applicants may be invited to take part in online assessments, group discussions or individual interviews. As a Co-operative enterprise Lakeland Dairies is committed to the communities in which we are based. We support the development of those communities through the creation of employment experience opportunities for students prior to the completion of their third level courses. A preference is given to students undertaking a course of study that is relevant to our business. To apply online please go to our Careers Opportunities page. The Work Placement application is listed as a vacancy so click on the Apply button at the right of the screen.